Wooden ridges and knobs will knead foot muscles, tendons and ligaments until they purr. A journey of a thousand miles may begin with a single step, but your feet still have to walk the other 1,999,999. After that, you'll want a few sessions with our handmade wooden foot massager. 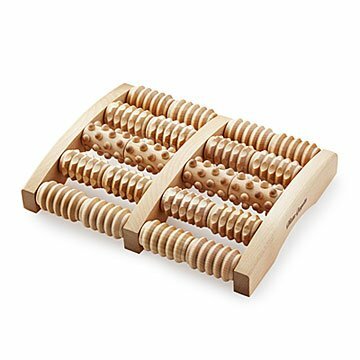 Its 10 ridged, ribbed, and knobbed rollers can knead those protesting foot muscles, tendons, and ligaments until they purr. Your happily humming nerve endings will send the message through your entire body to your brain, which will form the thought, "Gee, that feels good." (Note: Massager also effective after less ambitious journeys.) Handcrafted in Slovenia. One of our own tested this product... at her desk, no less. Visit our blog for a full account of her soothing at-work experience. I thought this would be a helpful relaxation device, but it turns out that it feels fantastic and they can't stop talking about how much it helps after being on their feet most of the day. Perfect relief for yourself or loved ones. Great for at home, whenever you want a massage. would have given 5 stars, but haven't heard back from giftees yet. I was very interested in the fact that is was handmade from wood. I must get one for myself. My mom is going through chemo and has achy feet so I went in search of a solution. Ever since she opened this gift we can't get her to sit without using it. Mission accomplished. I bought this for my daughter-in-law's Mom. She travels from Europe to visit the USA and thought she could either leave it here or carry it back with her. I have one and LOVE it. Our feet dispel a lot of toxins, so this is essential to have for detoxing. I got one for me and my bofriend and gave two as gifts. My friends are teachers and a Marine, and a hardworking firefighter. If we had all the money and time we wanted to get massages every day that'd be great but we don't! This foot massager is simple and effective and feels great.